Safety signs encourage a safe workplace, keeping the employees aware of potential hazards and emphasizing safety precautions. Here at OfficeRock.com we provide a huge selection of safety signs for virtually any office or business. The signs are available in plastic and aluminum, as well as durable vinyl options, which are known for their impressive durability. 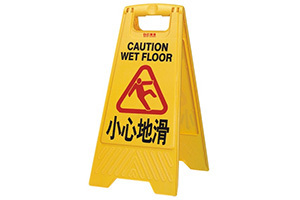 Even a simple wet floor sign board can make a huge difference in safety, keeping everyone informed of hazards they may not have been aware of otherwise. An informed workplace is a safer workplace, and good safety signs important tools to keep everyone aware and cautious, whether the sign is communicating a safety precaution, restricted area, or emergency procedures. Whatever your needs, we have the right safety signs to help preserve a healthy and productive environment. Order your safety signs from OfficeRock.com today and get free rewards.